Freshly-picked strawberries are one of my family’s favorite treats in late spring and early summer. These oven dried strawberries are a delicious way to enjoy the intense flavor of freshly-picked strawberries year round. I like to add them to trail mix and my boys love finding them in their school lunches and snacks. Can I dry strawberries in an oven? Oven dried strawberries are a simple to make, healthy snack. With just a few easy steps (and some time) you can have a crave-able naturally sweet snack your whole family will love. When making dried strawberries in the oven, it is important to slice your strawberries as uniformly as possible. This ensures the strawberries will finish drying at roughly the same time. I have found that 1/8 inch thick strawberry slices are thick enough to flip without tearing and yet not so thick that they require additional time to finish drying. After about two hours in the oven, the strawberries should be almost dry to the touch. This is when you want to flip them over so they can finish drying. During the last hour or so of drying, keep your eye on the strawberries. The small ends of the strawberries will finish drying first, and you can always remove them from the oven while the larger strawberries finish drying out. Your dried strawberries will only be as sweet as the fresh strawberries used to make them. Though strawberries are available year round in grocery stores, you will have the best results if you make dried strawberries with just-picked berries that are fresh from a local farm. Oven Dried Strawberries are a healthy and delicious snack. 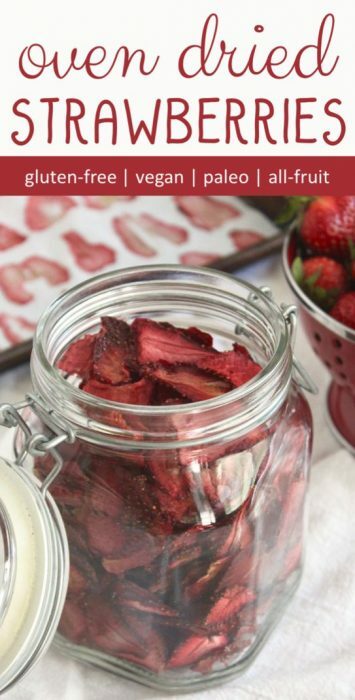 These dried strawberries can be enjoyed by all because they are vegan, dairy-free, paleo, gluten-free, and contain no-added-sugar! *Strawberries topped the 2018 EWG’s “Dirty Dozen” list (and are always high ranking on the “dirty” list). That is way I purchase either pesticide-free berries from a local farm or organic strawberries. Read more on pesticides and produce. A mushroom slicer can be used instead of a knife to slice the fresh strawberries, however the strawberry slices will be a little thicker than if you cut them by hand, which may increase your baking time. Please note that you want a veggie slicer with blades and not wires. Strawberries will cause the wires to bend, which creates unevenly sliced berries. 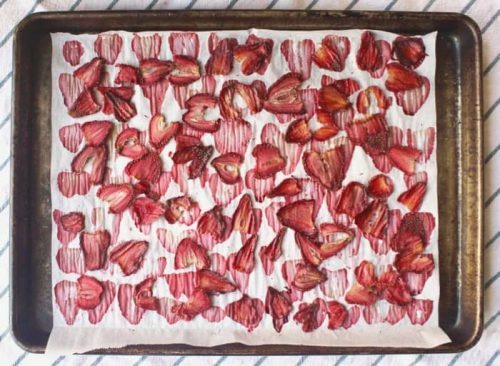 Multiple baking sheets of strawberries can be baked at the same time. However, this will increase the amount of time needed for the strawberries to dry completely. Strawberries can be dried in a convection oven or using the convection setting of an oven. Depending on your oven, this may speed up the strawberry drying time. Be sure to check on the strawberries often after two hours to prevent burning! How long can you store dried strawberries? I have successfully stored them in an air-tight container in my pantry for more than 6 months. However, this was ages ago before I had children. We are now lucky if our spring / summer stock pile of dried strawberries last us past the first month of school in the fall. Strawberries must be completely dry in order to have a long shelf life. If there is any doubt, you can always freeze dried strawberries to extend their shelf life. 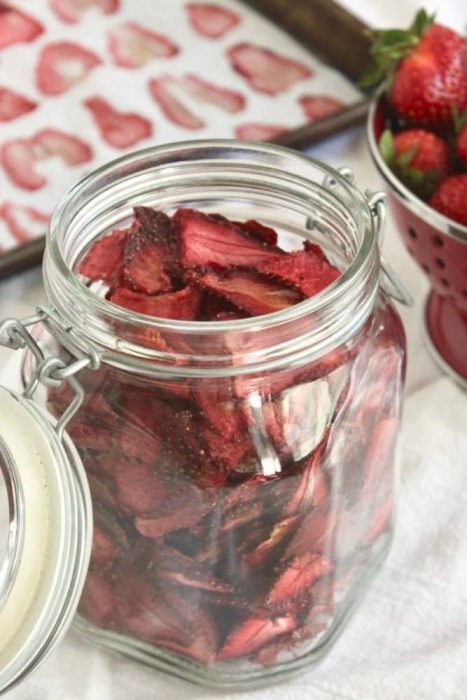 Homemade dried strawberries are delicious snacks! We like to eat these dried strawberries on their own, sprinkled on top of homemade granola, and include them in a favorite healthy snack mix. Want to try other delicious oven dried fruit snacks? In addition to these delicious and crisp oven dried strawberries, my family loves homemade blueberry fruit leather, which transforms blueberries into a portable, mess-free snack. Oven dried peach chips made with sweet summer peaches are another of our favorite all-fruit snacks. This recipe was originally published in April, 2017. The recipe has since been updated with enhanced recipe instructions and refreshed photos. Hi Nancy. This is a great question! I don’t see how oven drying can increase the sugar content in a strawberry. However, the person might have meant that drying strawberries concentrates the sugar content in a strawberry, which it does. – 3.8 grams of protein. Per gram, the amount of sugar appears to increase when you compare dried strawberries to fresh strawberries. However, if you compare one fresh strawberry to one dried strawberry, the sugar content is the same. PS – it is worth noting that when you bake starchy foods (like sweet potatoes) for extended periods of time at high temperature some of the starch does break down into sugar. However, that does not happen with strawberries because 1) they are not starchy and 2) the temperature is much lower. Michelle – Merci beaucoup for the suggestion of a mushroom slicer! I will definitely have to purchase and try one before our next strawberry season. I am so happy your grand kids love the dried strawberries! Thanks Dawn! I have yet to try a strawberry recipe that I don’t like!! These dried strawberries are my boys absolute favorite snack… I try to ration them a bit so they last a little longer than the first month of school. They are also delicious in granola (especially “chocolate” granola!!!). I hate to seem lazy but I believe one of those boiled egg slicers would be a quick and easy method to get even slices. I think they slice around that size! Ryan – this is a brilliant idea, not lazy at all! If you try it, I would love to know how it works. And I will definitely give it a try once we are back in strawberry season here in NC. Thanks for the suggestion! Trying this today. I am using drying rack that I have for my oven. My oven actually has a drying setting. The strawberries aren’t evenly cut so we will see how they come out. Sarah – Since your strawberries aren’t evenly cut, just keep an eye on them toward the end of the drying… and remove the thinner ones that finish first. I hope you love these dried strawberries! Would this method work if using whole blueberries, blackberries or raspberries? Bananas? I love this idea but mine all stuck to the parchment paper (like completely flattened down onto it and impossible to get off!). What did I do wrong? Would love to try it again! Oh Kirsty, how frustrating… I am sorry! I have never had my strawberries completely stick to the parchment, though I have had them rip or break as I am peeling them off the parchment to turn them over. 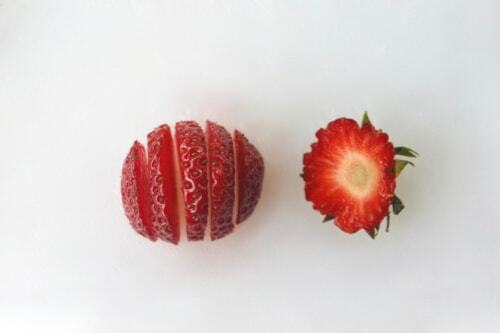 This happens if the strawberry slices are not sliced thick enough. I dehydrate my strawberries too! They are so sweet, and a great way to preserve them. I agree about sourcing locally too – even more of a reason to preserve them since the season is short. Thanks Anne! I find that farm-fresh strawberries spoil so much faster than the ones we can find year-round at the grocery store. (Different variety, I imagine?). It is always a race to enjoy them… and drying some lets us savor the season a little longer! Yes, I happily purchase shorter “shelf life” foods grown from local farmers when they are in season! Is there any way possible to use frozen Strawberries? If so, would I use them frozen then put them in the oven or thaw, drain juice then follow recipe. No one in the family really likes eating the frozen ones after thawing so i was trying to find a way to get them eaten up. Thanks for the help. I don’t think frozen strawberries will work well in this dried strawberries recipe. As you mentioned, they will release a lot of juice during the baking process. This juice turns into a clear, glassy film surrounding the berries. 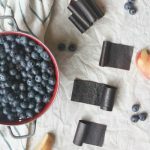 However, you could use the frozen strawberries to make a fruit leather, like in this blueberry fruit leather recipe (https://feedthemwisely.com/oven-dried-blueberry-fruit-leather). I would use two apples, instead of one, for each two cups of frozen fruit. The apples add sweetness to the fruit leather as well as pectin, which gives it some flexibility. Enjoy! Oh my, I’m just dying to have a big batch of these and put them in morning oatmeal, granola, and snack mixes! What a great way to use the mega surplus of berries about to come into season! Thanks Monica! Drying is a wonderful way of preserving the intensely sweet flavor of just picked strawberries! The strawberries we’re getting right now are so big, beautiful and ridiculously flavorful. We’ve never tried oven drying fruit before but I’m looking forward to trying this. Strawberries are my favorite fruit, I’d love to add them to granola or nuts! Lauren – We too are loving the incredibly delicious strawberries that are available right now! Please let me know how you like the dried strawberries! I haven’t yet ventured adding them to granola… that sounds amazing! What a great afternoon snack these would make! I think they would be good in oats too! What a great idea, and looks easy too! Thanks for all the tips on best way to do this, love the idea of putting this in trail mix! Thanks Paige! These dried strawberries are definitely easy… I just made 3 batches with strawberries we picked yesterday! I have a dehydrator but my strawberries didn’t turn out as well as these. I think I might have cut mine too thin. Will have to try your method. Kitty – I made the mistake of cutting mine too thin the first couple times I made these dried strawberries… it was a nightmare to flip them over. Please let me know how yours turn out! I would DEVOUR these! I love fruity snacks like this. They seem really simple to make, too. Definitely going to try this when I see good berries at the store next time. Thanks Michelle! We went to a strawberry u-pick farm today and have oodles of delicious, intensely sweet berries. I have some in the oven right now so we can enjoy them when it is no longer strawberry season! Fantastic idea! We always pick tons of fresh strawberries at the patch and then eat them for days and days and days! Love the idea of saving some of them for later! Thanks Jenni! Yes! We do the same! Strawberry picking season is a definite favorite. And we love how these dried strawberries capture and intensify the flavor of just-picked strawberries! Hi You Say To Dry Strawberries for about 2 hours then turn & bake another hr? so i am baking these for 3 Hours? Hi Lorrie – That is correct, it will take about three hours total to dry the strawberries. However, depending on how thick you cut them and your oven, there may be some variation on the total time. Strawberries…yum,now how about trying apples,peaches,even tomatoes? I plan to try drying all my extra apples.Thanks! BJ. B.J. – I have been trying out recipes for homemade “apple chips” for ages! I can’t seem to get them to consistently dry out and not burn. Please know I am working on it!!! (tomatoes and peaches… great inspiration for this summer, thank you! Cut apples just slightly thinner than you are cutting your strawberries. Lay them in parchment paper and bake for about 4 hours. Shut off the oven and let the apples cool in the oven. Take them out only when you can handle the pan without a mit. I like to do them plain, sprinkled with cinnamon or with sugar free strawberry or cherry jello powder. Thank you Jacob – I look forward to trying your method for drying apples! Thanks Sara! I hope you enjoy them!!! Will using the convection feature help/hurt? I am new to this. Hi Barb! I just finished making a few batches of these strawberries and tried out the convection setting on my oven. The first batch I followed the directions as written (2 hrs, flip berries, 1 more hour). And a few of the berries were over dried (brown, with a bit of an off taste). However, when I made another batch and shortened the total time to 2.5 hrs (instead of 3 hrs), the dried strawberries were perfect. So yes, you can use convection setting… but you must be vigilant in the final hour that you remove the berries before they over dry! mmm this strawberry looks so cute! This is a great way to eat this delicious strawberry all year round. I definitely want to try this! Thanks for the great idea! You are welcome Veena – I hope you enjoy them! Dried strawberries are so expensive!!! I thought about making my own but didn’t think it would be possible without a dehydrator! My pleasure Claire! These dried strawberries are definitely much more affordable than store-bought… especially if you pick your own strawberries when they are in season. I had no idea that you could make these at home in your oven! I totally pay through the nose for these, lol! They are great for adding to frosting too to make strawberry frosting without the extra moisture of the fresh fruit! Thanks Amy! I never thought of adding dried strawberries to frosting… I will definitely have to try! 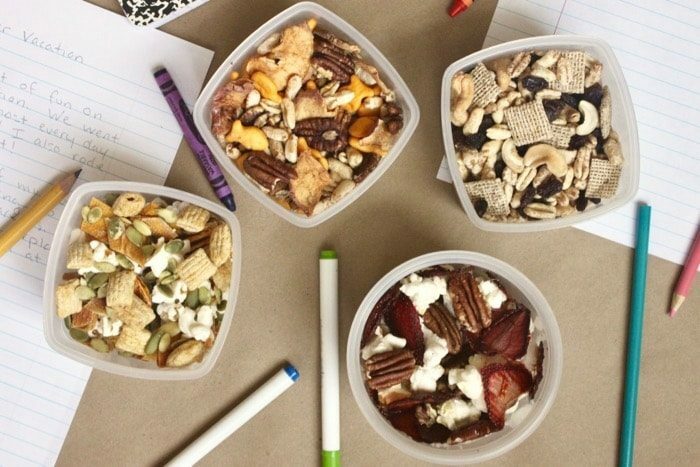 Such a great idea for adding to my trail mix and Greek yogurt! Thanks for sharing this recipe! 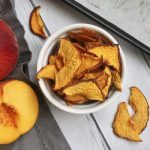 I’m obsessed with dried fruit at the moment and this sounds super easy! Hi Shadi – yes! These dried strawberries are very easy (if a bit time consuming) to make. But the time is definitely worth it! I am just waiting for my garden strawberries to start showing signs of life! There’s nothing like a home grown berry and this is a great way to preserve them – they are only around for such a short time!! Hi Emily – I completely agree! The flavor of freshly picked home-grown strawberries can not be matched. We love snacking on these dried strawberries all winter long as we look forward to late spring when our strawberries start growing again! Omg I never knew this was so simple, thanks so much for sharing! Absolutely – these dried strawberries are one of our favorite additions to “snacky trail mix”!! !